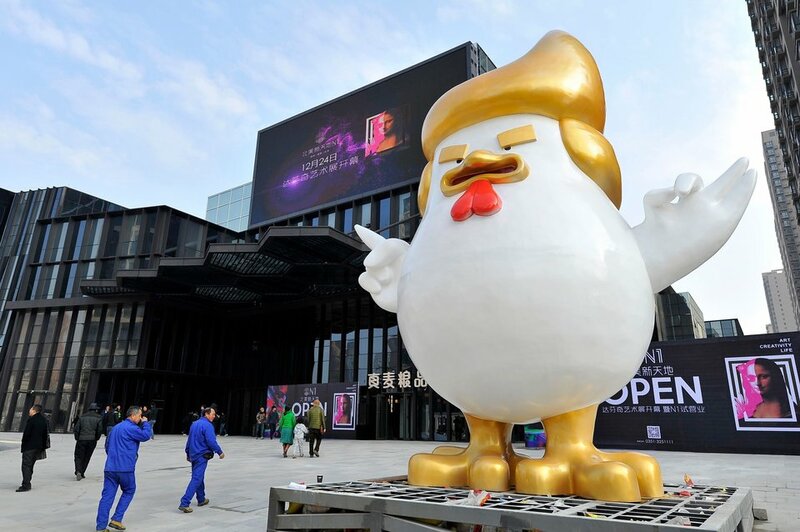 This photo taken on December 24, 2016 shows a giant chicken sculpture outside a shopping mall in Taiyuan, north China’s Shanxi province. 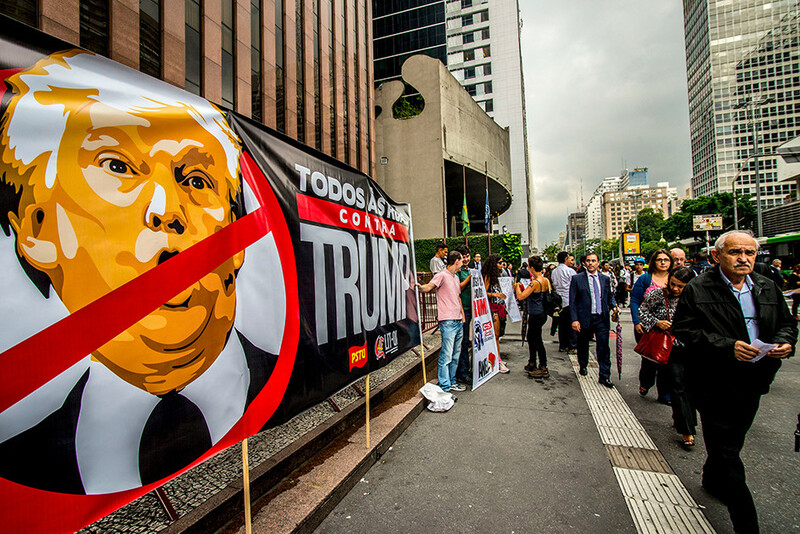 Months after pro- and anti-Trump protesters clashed violently in São Paulo, displeased demonstrators returned to the streets on the day of his inauguration. 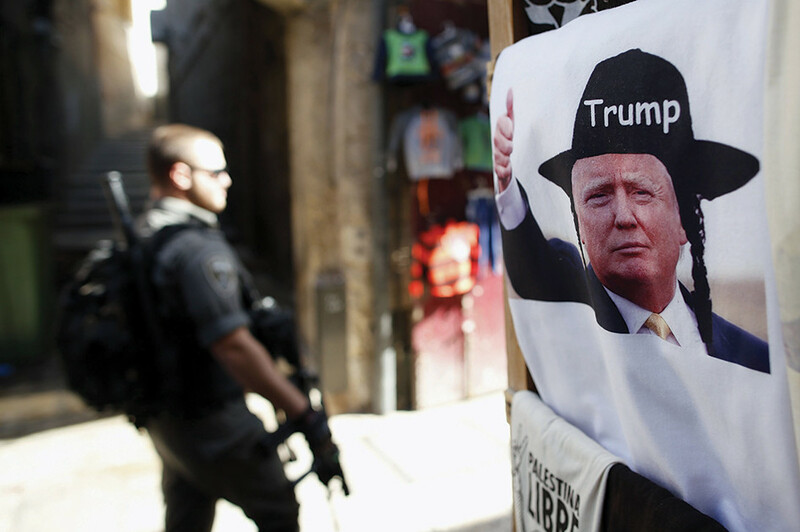 In the days after Trump’s election, a souvenir shop sold politically satirical merchandise in Jerusalem’s Old City, including items depicting Trump as a Hasidic Jew and Barack Obama donning a kaffiyeh. 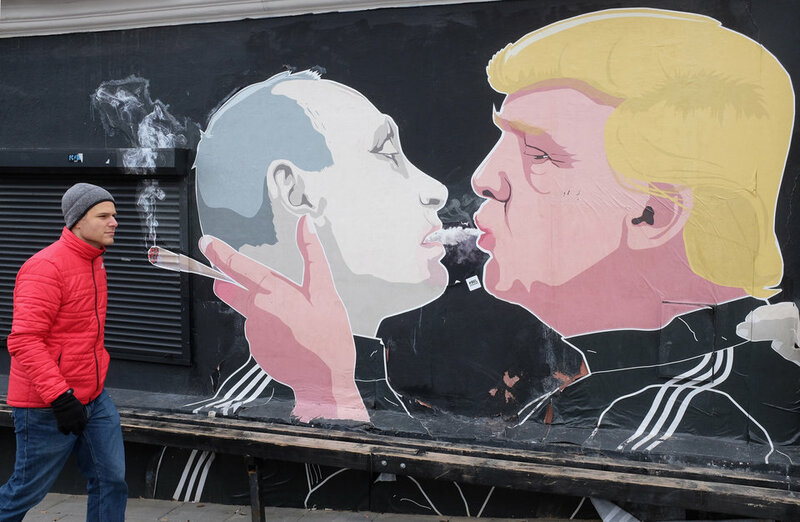 Israelis, on the whole, preferred Hillary Clinton in the election, but Hasidic Jews have expressed approval of Trump’s alignment with Israeli Prime Minister Benjamin Netanyahu and the fact that his daughter Ivanka converted to Judaism. 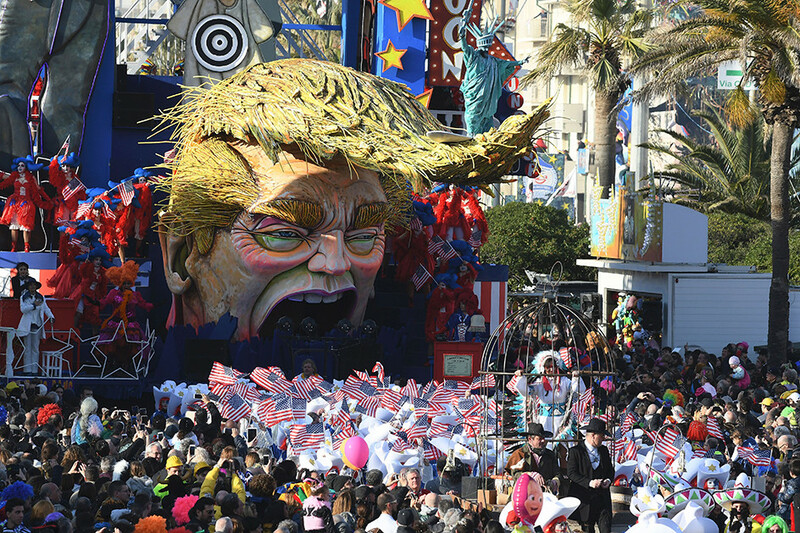 The Carnival of Viareggio, an annual Mardis Gras parade hosted by the Tuscan city of Viareggio, is traditionally celebrated with giant papier-mâché floats depicting caricatures of popular characters and politicians. 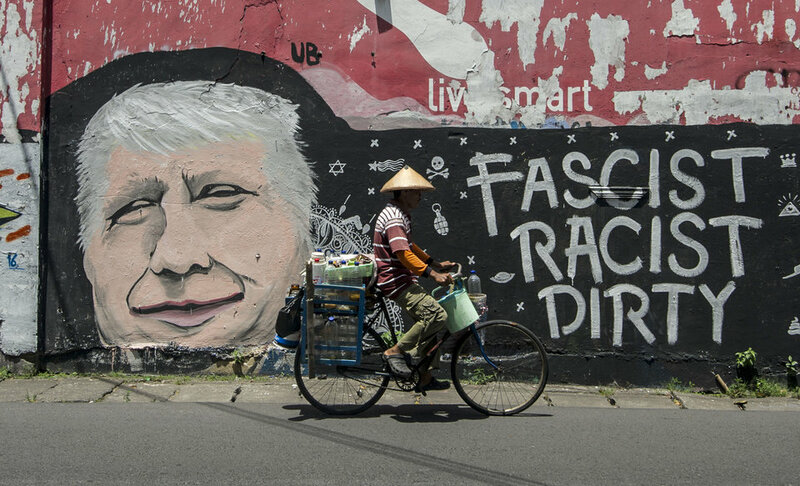 This year, parade floats featured elaborate masks of Trump and Hillary Clinton. 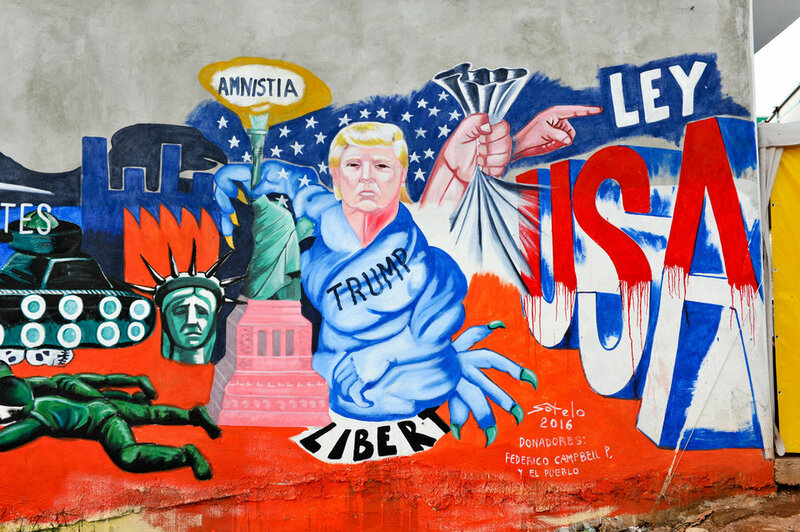 Detail of the mural paint made by Mexican artist Luis Sotelo called “We are migrants not criminals” (Somos migrantes no delincuentes) in Tonatico, Mexico, on 25 June 2016. 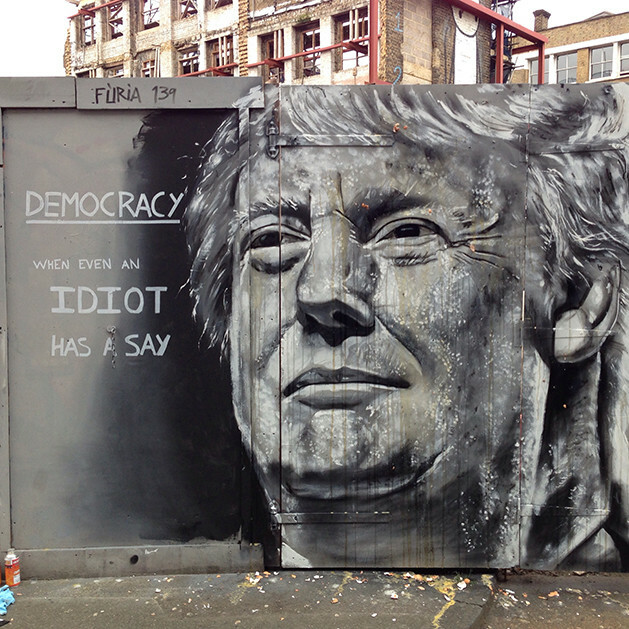 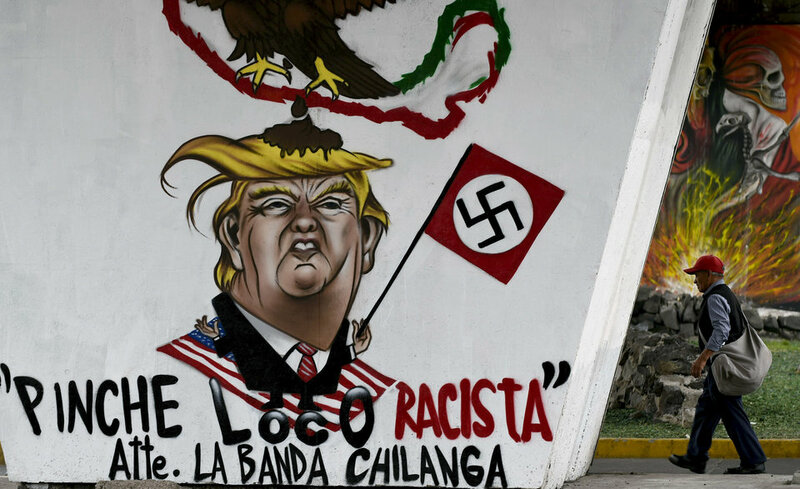 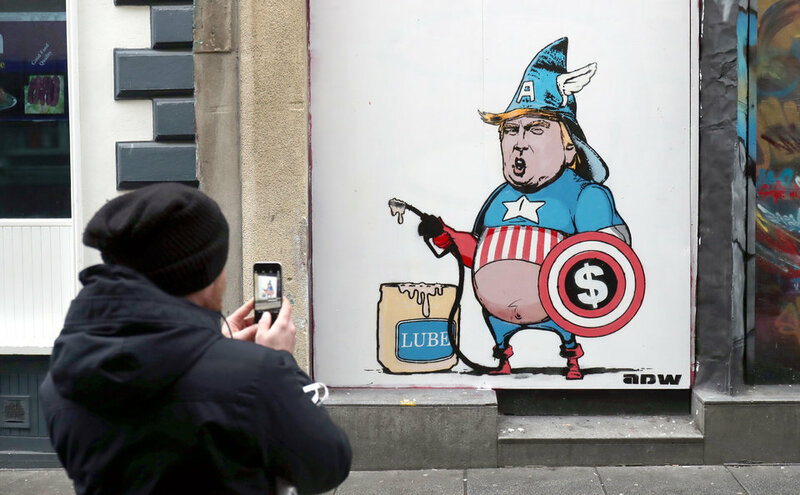 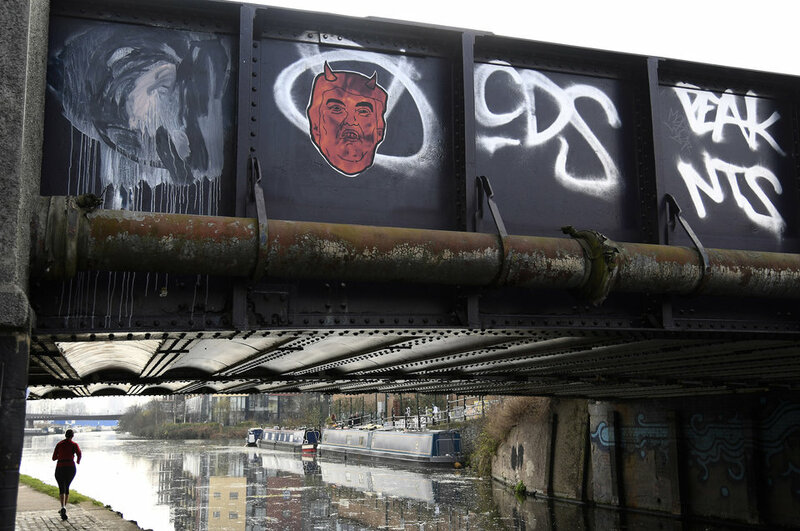 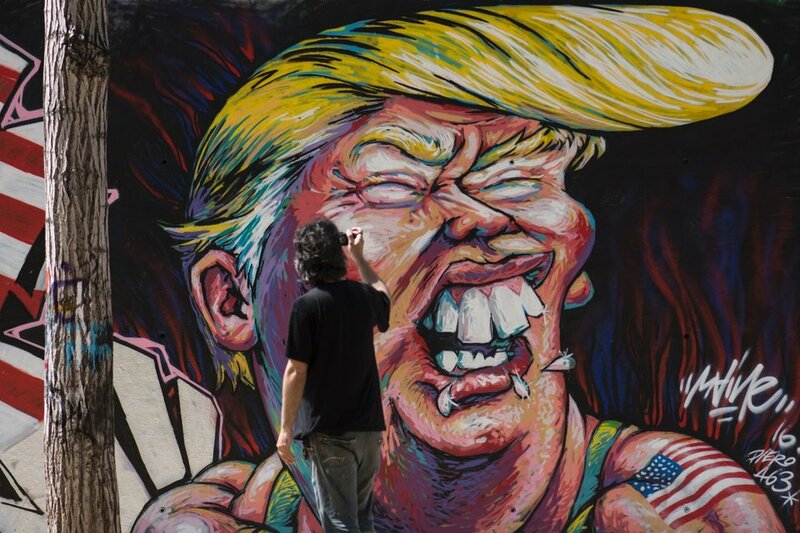 In Mexico City, graffiti denounced Trump on the day of his inauguration. 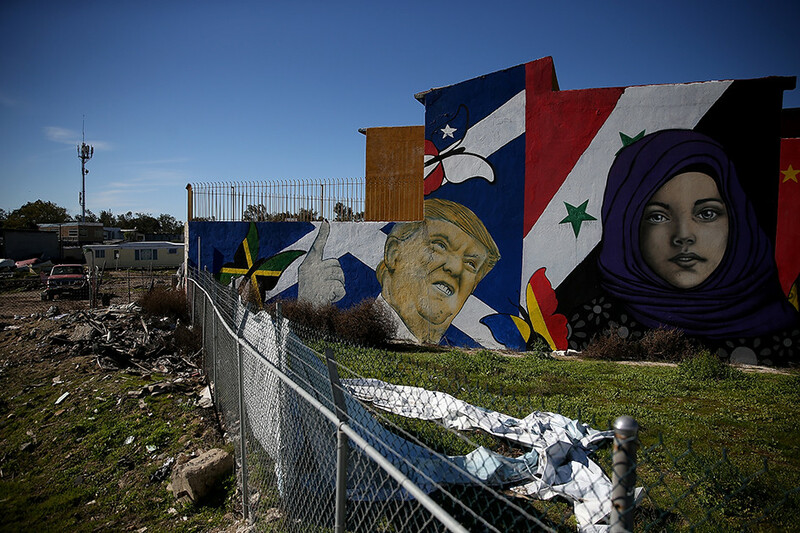 A mural reading “Todos somos migrantes” (“We are all migrants”) in Tijuana sits close to the U.S.-Mexican border. 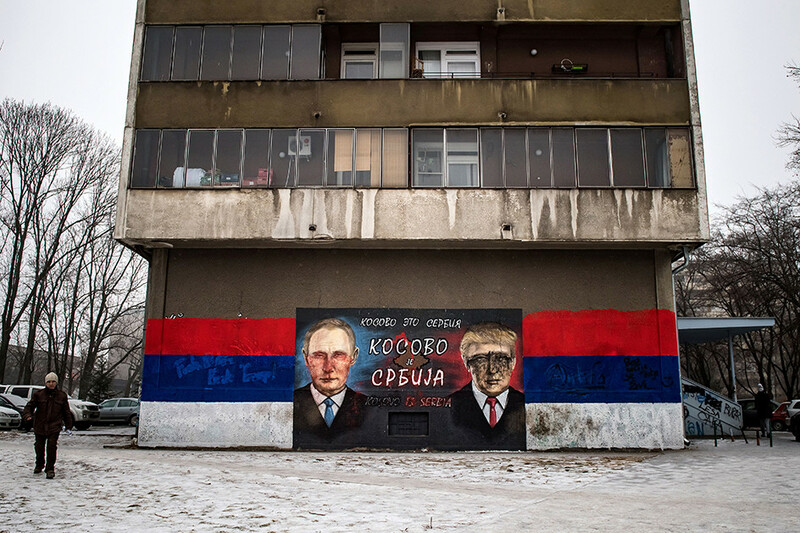 The Cyrillic words at the center of this painting of Trump and Putin in Belgrade read “Kosovo is Serbia,” a nod to Serbia’s, and Russia’s, refusal to recognize Kosovo’s sovereignty. 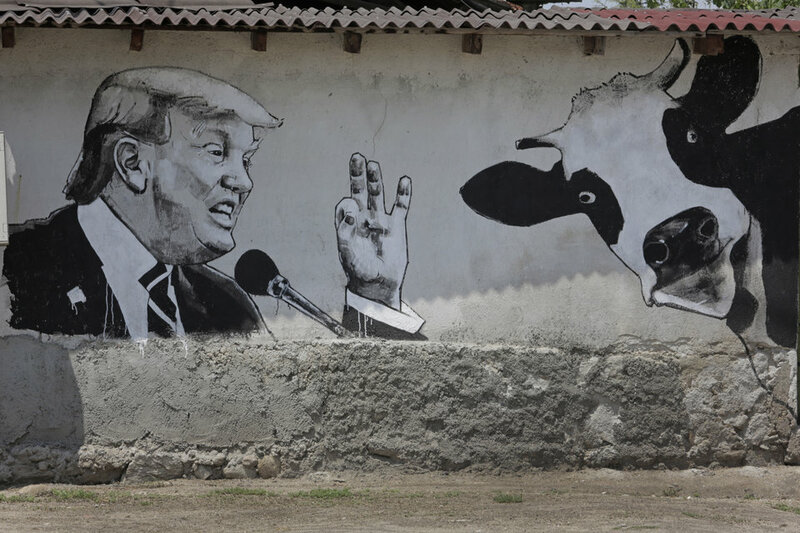 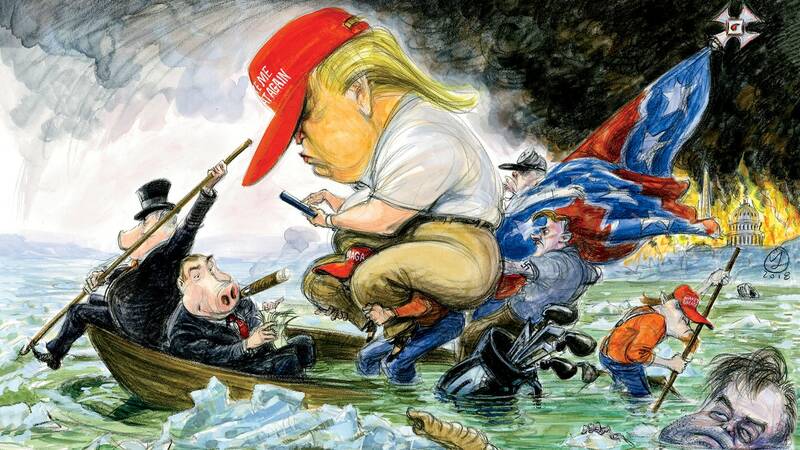 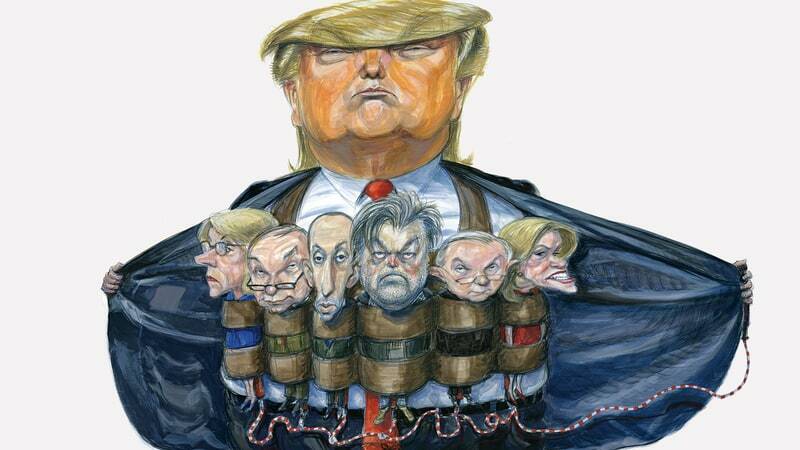 Trump’s candidacy has renewed enthusiasm for the United States among Serbia’s ultranationalists, many of whom see him as an ally in their opposition to globalization. 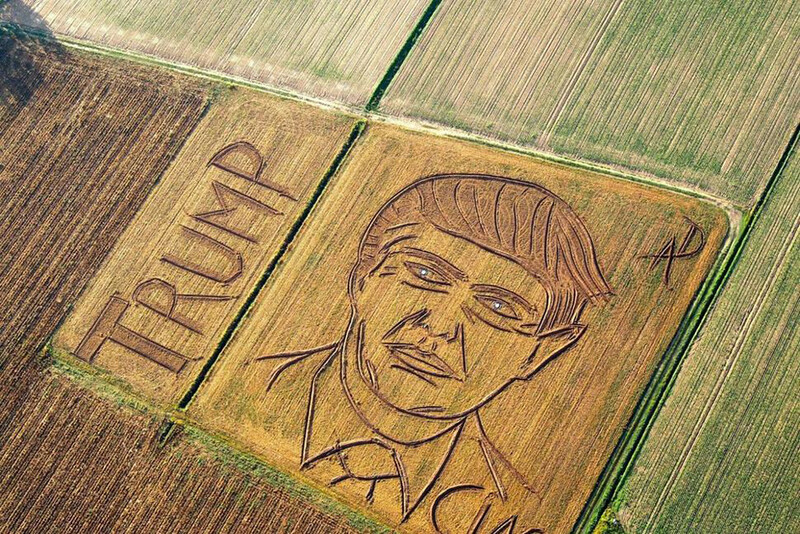 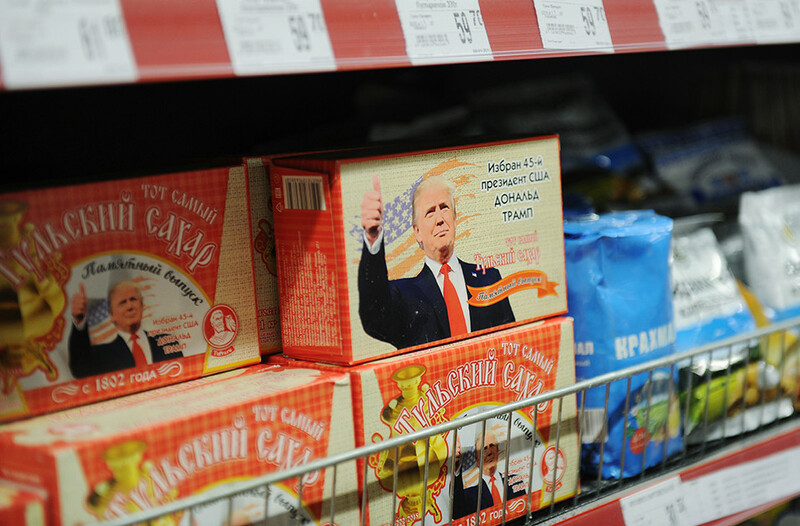 In Russia, where Trump’s friendliness with Putin has been well-received, Trump has begun to appear in commercial contexts, including on a commemorative smartphone case released shortly after his election and on sugar boxes at a supermarket in the city of Tula. 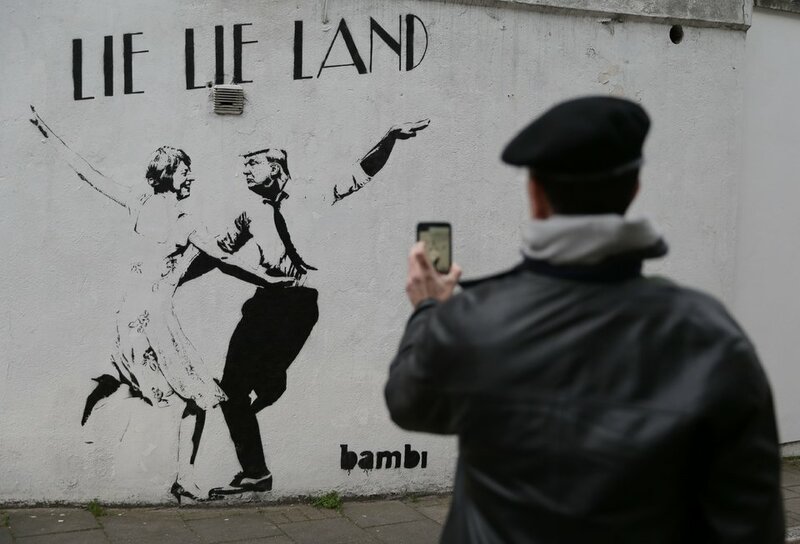 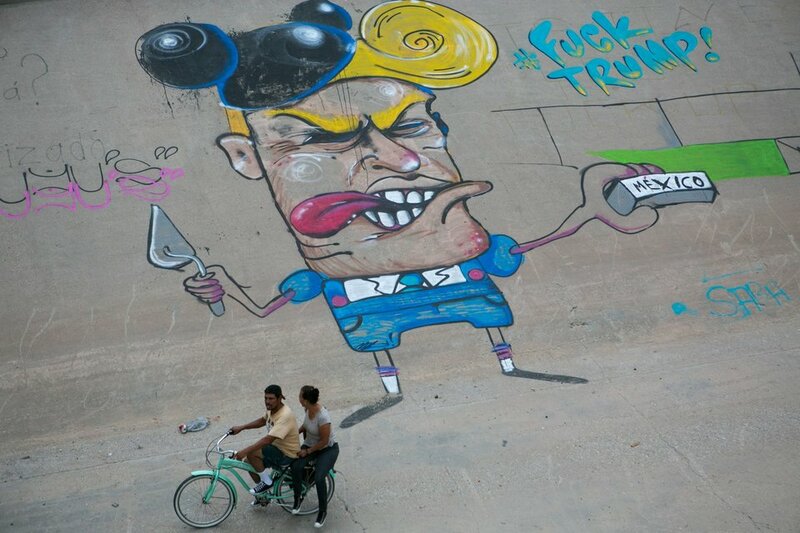 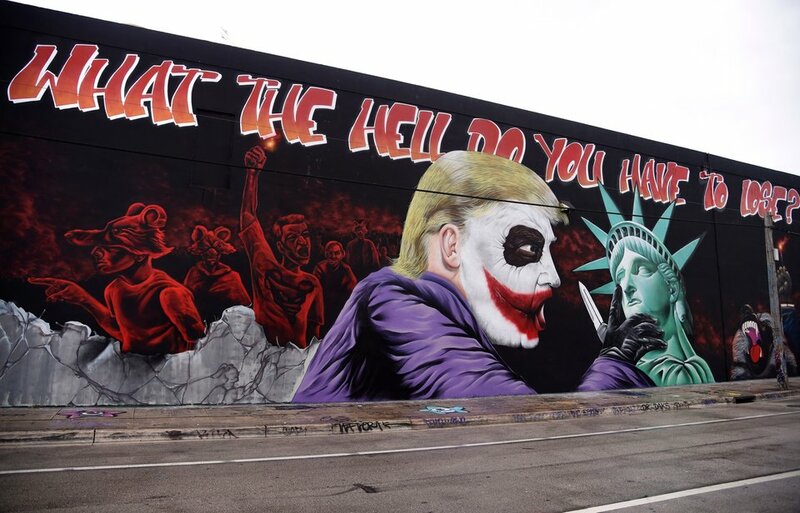 A Donald Trump mural covers a building in the Wynwood neighborhood of Miami, Florida, on October 27, 2016. 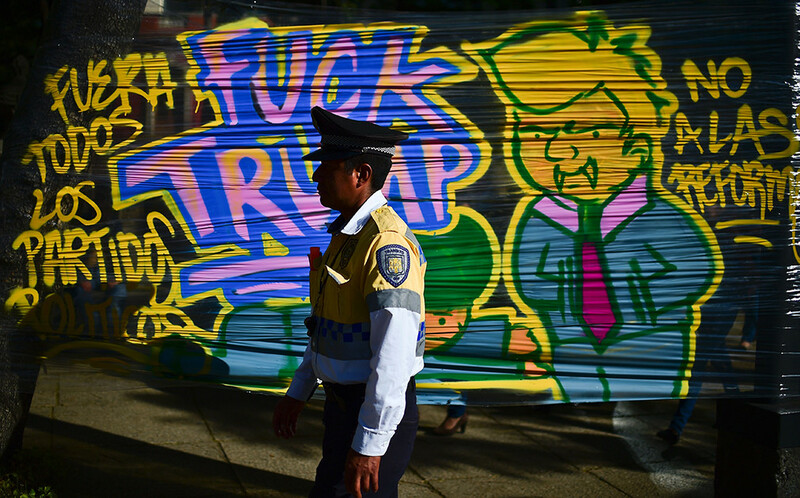 This entry was tagged Brazil, Bulgaria, China, England, Indonesia, Ireland, Israel, Italy, Lithuania, Mexico, Russia, Serbia, Spain, The World, USA.